But it has almost healed so I'm back! I hope to post more frequently now! And now for the blog post. 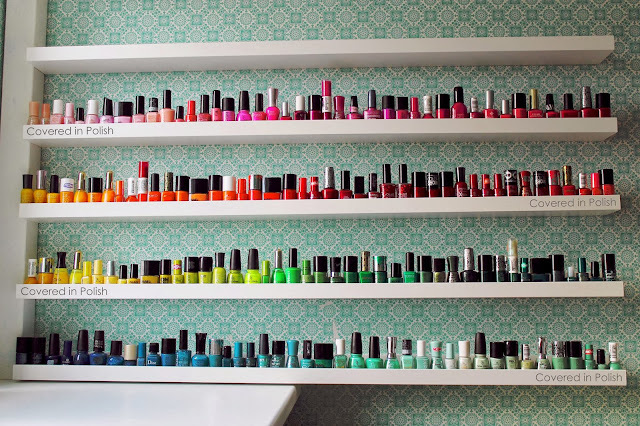 I now have two walls full of nail polishes; five large shelves and one small shelf on the left wall and five large shelves and one small shelf on the right wall. I got one small shelf above my bed, so my BF and I can store our phones and his glasses at night (I have a high sleeper bed). 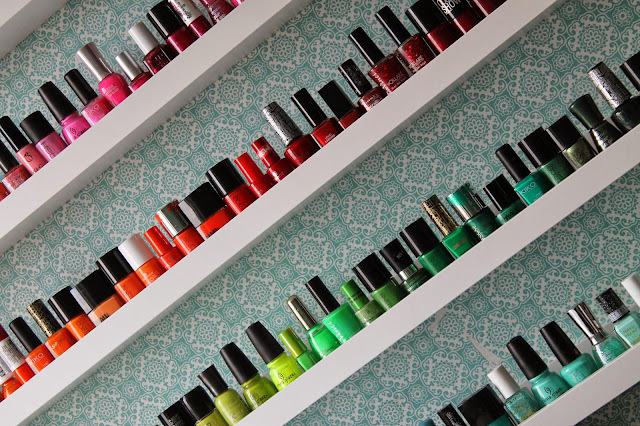 I got all my polishes sort by colour. It costed me about two whole days to do that. It was really a pain in the a** but the results are soooooo much better now! I don't want them sort by brand and then by colour, because I own over thirty brands of nail polish. If I do, it would look like a big mess. At the upper shelf on my right wall I have my multi glitter polishes which are almost impossible to sort by colour ;) I also have some small collections like the Fuzzy Coat polishes by Sally Hansen, Euro Centrale mini collection & Take Ten mini collection by OPI and some of H&M (all of those are not in the picture). The first shelf of polish actual sort by colour contains only pinks (!!) which go from lightest to brightest/darkest. The next shelves go from corals to reds, from reds to oranges, from oranges to yellows, from yellows to greens, from greens to mints and from mints to blues. Then, on the left wall I started at the after last bottom shelf with the leftover blues (I have a lot), from blues to purples, from purples to burgundies, from burgundies to coppers (what? yah..), from coppers to browns, from browns to nudes, from nudes to golds (whatever..), from golds to holographic glitters, to silvers, to greys, from greys to blacks, from blacks to whites (weird gradient btw) and from the whites to the iridescent toppers and flakies.